If you’ve recently noticed that you have a white tongue or an odd coating on your tongue, this could simply be excess debris or it may be a sign of a medical problem. Following are possible medical reasons for a coated tongue and the best remedies for treating the problem. Hairy Leukoplakia Reason: This condition is seen as a hairy, irregular white patch along the sides of the tongue. It’s caused by the autoimmune condition called Epstein-Barr. 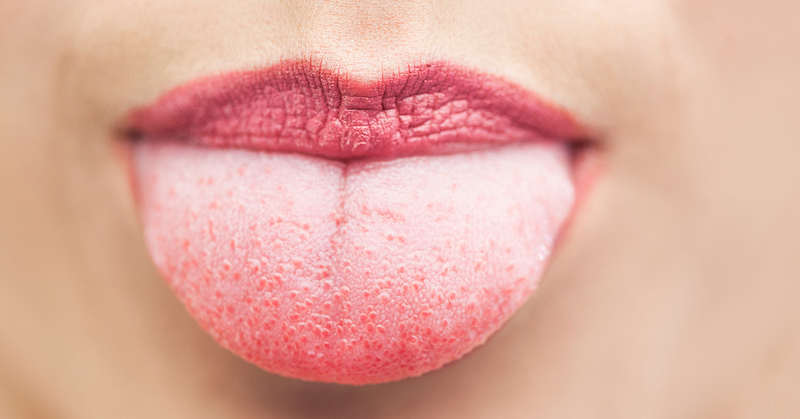 Remedy: This type of coated tongue can be a recurrent problem, so people with an immune-compromising condition are usually treated with antiviral medications. If you are not suffering from a weakened immune system, then an HIV test may be given to see if there is any correlation. Leukoplakia Reason: Unlike oral thrush, this type of white coating on the tongue cannot be simply wiped away. The cause of this condition is sometimes uncertain, but it may be associated with tobacco use or a recurrent irritation in the mouth. Remedy: The remedy could be as simple as stopping a smoking habit, but since it results from smoking, it may be an early indication of oral cancer. It’s wise to have your doctor do a biopsy and continually monitor the area for any changes. Linea Alba Reason: Instead of causing a completely coated tongue, linea alba results in a thin white line along the edges of the tongue. It is simply caused by an irritation or trauma from aggressive chewing. Remedy: Since biting your tongue usually causes it, no treatment is needed. Oral Lichen Planus Reason: Oral lichen planus is a chronic inflammatory condition caused by an autoimmune response. It can result in a coated tongue, yet the coating appears as a lace-like white pattern. Remedy: There is really no treatment for oral lichen planus because it’s an autoimmune response, but a doctor should regularly monitor it since any changes could indicate oral cancer. Oral Thrush Reason: This condition is also called candidiasis and it results from an excess of yeast in the mouth, which creates the appearance of a coated tongue. It often occurs after you’ve taken antibiotics, if you’re under stress, or facing an illness because these conditions disturb the balance of bacteria in your system. Remedy: While you can easily wipe away the white sections of yeast, you always should brush your tongue when brushing your teeth, especially if you’ve been sick or on medication. So, why should you brush your tongue? Since oral thrush can develop at any time, brushing your tongue on a regular basis could help to prevent any problems. But to completely correct the white tongue, it should be treated with an antifungal medication, tablets, or lozenges that get your system back in balance. To learn about our family dentistry practice in Atlanta, call today at or make an appointment. Dental One Associates offers affordable family dentistry and gentle, compassionate dental care in Atlanta. With 8 affiliated practices throughout Georgia, our offices are conveniently located with extended hours to meet your needs. At , we provide most dental services, from basic preventative care and general dentistry to specialized procedures and complete dental reconstruction. We accept most dental insurance plans and offer affordable financial solutions for any budget. Patient satisfaction is our top priority and we strive to provide the exceptional, affordable dental care and personal touch that lead to lasting relationships. A smiling patient is our greatest reward and we look forward to keeping those smiles healthy, beautiful, and bright. Discover an affordable dentist who truly cares at .